Code in the source folders. Jars and classes folder associated with the project. Classes and libraries exported by projects referenced by this project. 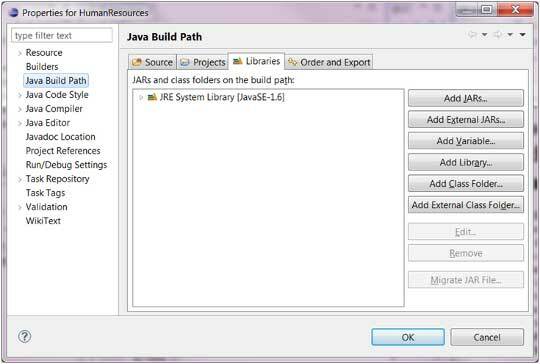 The java build path can be seen and modified by using the Java Build Path page of the Java Project properties dialog. To bring up the Java Project properties dialog box, right click on a Java Project in the Package Explorer view and select the Properties menu item. On the left hand side tree select Java Build Path. A common requirement seen while developing java applications is to add existing jars to the java build path. This can be accomplished using the Libraries tab. In the Libraries tab, just click on Add JARs if the jar is already in the Eclipse workspace or click on Add External JARs if the jar is elsewhere in the file system.